Silybum marianum is an annual or biannual plant of the Asteraceae family. This plant can take on impressive proportions: it grows from 1 to 6 1/2 feet in height with its base at times reaching nearly 5 feet in diameter. 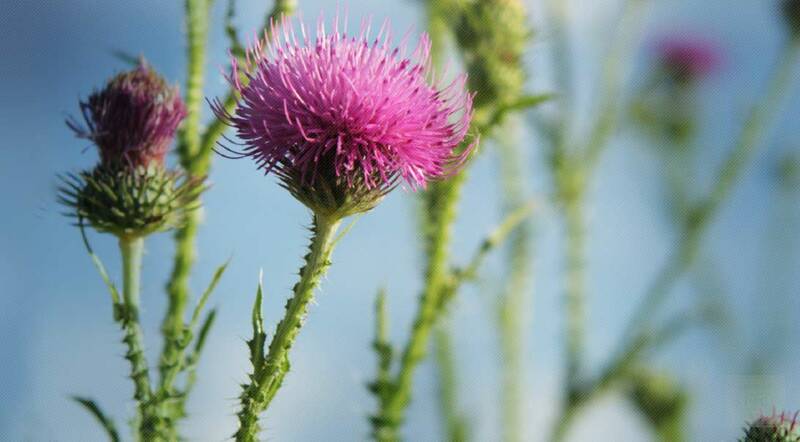 Milk thistle grows in a conical shape, the stem being grooved and somewhat cottony. In the larger specimens the stem is hollow. Milk thistle's leaves are oblong to lanceolate— and they are either lobate or pinnate, with spiny edges. The leaves also have milk-white veins, are devoid of hair, and are shiny green. The red-purple flower heads are 1 1/2 to 4 3/4 inches long and wide. They flower in the summer through autumn (more specifically from June to August in the North and from December to February in the Southern Hemisphere). Like its leaves, milk thistle's bracts are hairless, but have triangular, spine-edged appendages, that are tipped with a stout yellow spine. The achenes (small, dry, one-seeded fruits) are black, with a simple long white pappus, surrounded by a yellow basal ring. 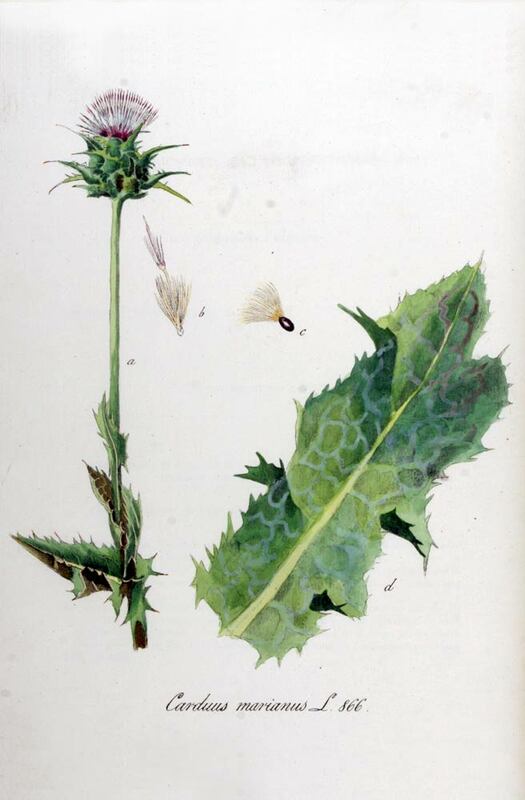 Legend states that the milk-white veins of the leaves originated in the milk of the Virgin which once fell upon a plant of Thistle, hence it was called Our Lady's Thistle; the Latin name of the species has the same derivation. Cardus marianus, milk thistle, blessed milk thistle, Marian Thistle, Mary Thistle, Saint Mary's Thistle, Mediterranean milk thistle,variegated thistle, Scotch thistle. Not to be confused with Centaurea benedicta (aka Cnicus benedictus, aka Blessed Thistle). Silybum marianum is a native of Southern Europe through to Asia and is now found throughout the world. Grows in waste places, areas by the sea, and in cultivated garden beds in full sun. This plant will succeed in any well-drained fertile garden soil, but prefers a calcareous soil. Sow seeds directly into the garden beds during March or April; the plant will usually flower in the summer and complete its life cycle in one growing season. Alternatively the seed can be sown from May to August when the plant will normally wait until the following year to flower and thus behave as a biennial. Seed harvest occurs in 2 steps: cutting and threshing. Harvesting occurs in August, around 2–3 weeks after flowering. Store dried milk thistle seeds and powdered dried milk thistle seeds in airtight containers in a cool, dry place.